In amongst all the commotion surrounding Lewis Hamilton at the British Grand Prix this weekend, one of the most anticipated announcements of the past few years was finally made when General Motors revealed its intention to enter the Formula 1 championship for the 2008 season. "There has been a lot of speculation as to when GM, as one of the largest car manufacturers in the world, would enter Formula 1," said Dermot Billingsworth, Marketing Director of Vauxhall motors speaking at the Silverstone launch. "The time is now right." General Motors said that it feels its Vauxhall Nova brand fits best with the ‘young aspirational male’ demographic, an area where the marque’s traditional strength has been under assault with the resurgence of hot-hatchbacks from German and French manufacturers. "Our aim is that the design of our challenger, the NOVA-F1, will represent what our brand means to young men, and make F1 technology more relevant to road car design. " said Mr Billingsworth. "It will have the loudest engine on the grid. Not only that but the exhaust pipes will be bigger and made from the shiniest chrome on Earth. The only thing brighter will be the turquoise neon-strips under the car." Mr Billingsworth said that the car would feature an innovative sound system with the driver actually sitting in a super-amplified ‘bass bin’. "You will definitely hear this car on the track!" he added. "The sound system will be a traditional thumping drum beat loud enough to hear over 22 F1 engines." The Vauxhall Racing team says that it isn’t just in technology where track and road should converge, but in race strategy. "Like everyday driving for our young customers, the most important aspect of a Grand Prix are the seconds after the red lights at the start," Billingsworth explained. "So the NOVA-F1 will be tuned to burn as much rubber as possible past the girls in the start-line grandstand." Motor Racing journalist’s from around the world appeared sceptical at the prospect of starting up a works team from scratch and making the start of next year’s Melbourne Grand Prix in March. 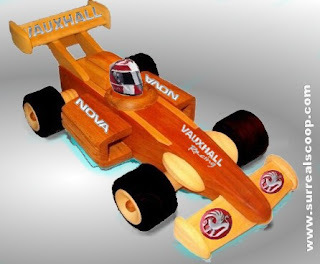 The question was put to Mr. Billingsworth of how long it would take to turn the wooden concept car on display into a competitive carbon-fibre racing car. "Concept car?" he responded. "Carbon Fibre? I don’t think you fully appreciate the teenage Vauxhall Nova customer."